A US furniture store owner is set to lose $7m (£4.2m) after promising a full refund to customers if the Seahawks beat Broncos in Sunday's Super Bowl. The Seahawks duly won the game 43-8, which means about 1,000 customers will now get their orders free. Nicknamed Mattress Mack, Jim McIngvale is well-known for his attention-grabbing ploys. Though substantial, the loss amounts to only 6% of Mr McIngvale's annual income. He says it is good marketing. Mr McIngvale ran the Super Bowl promotion for 10 days at his two Gallery Furniture stores. To win, customers had to purchase at least $6,000 worth of furniture and have it delivered before kick-off on Sunday. The average customer who was eligible for the refund bought around $7,000 worth of furniture. McIngvale is philosophical about the loss and says his business is getting priceless media coverage. "It's a big hit, but it's a marketing expense. But more importantly, it's a brand-builder," Mr McIngvale said in a phone interview. It is not the first time Mattress Mack has pulled this kind of stunt. Earlier this year, he refunded almost $700,000 to customers who bet correctly on the Super Bowl play-off victors. In December, he was honoured by President George H W Bush for his anti-drugs campaigning, and he regularly gives talks to young people in Houston about his experience with addiction. 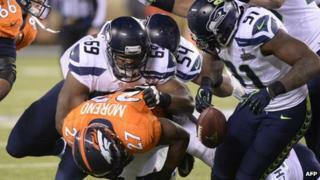 The Super Bowl was the most-watched television event in US history, the Fox TV network has said. The event drew 111.5m viewers on Sunday night, it said.